The Resistance is a game of deception and intuition for 5-10 players. Each player secretly is a member of The Resistance (viva!) or a Spy, and has a simple goal – win three of the five missions attempted during the game. Each player’s role remains hidden the entire game, only to be revealed in triumph or defeat once the third mission has been won by the Resistance or the Spies. Each turn a player is passed the Leader token, then chooses a number of players to go on the current mission. The number of players is determined by the numbered mission on the board, and changes as the game progresses. Each player – even those not chosen to go on the mission – secretly votes to approve or reject the Leader’s selected team of agents. If the team is rejected by the majority vote, the Leader token passes clockwise to the next player, and the team selection process is repeated. If five consecutive teams are rejected by the players, the Spies immediately win the game, and the Resistance is crushed! If the team is approved by a majority vote (A tie vote counts as a rejection), then those players selected for the mission are given two cards – one that says “Success” and one that says “Fail.” Each agent on the mission secretly chooses one of those cards and places it face-down in the middle of the table. The Leader then shuffles those cards and reveals them… and a single “Fail” card fails the mission (with a few specific exceptions, noted on the game board), which is a failure for the Resistance and a victory for the Spies. No “Fail” cards means success for the Resistance and happy times for all those fighting the good fight! Play continues until one team has won three missions, at which point the game is over. I have a soft spot for “Hidden Role” games – those games where your identity is a secret for part or all of the game – and any games that let me bluff, lie, and deceive other players while I work towards a victory. I think it’s an important type of game for game groups to play together, as the interpersonal skills required to appropriately represent certain desires in-game are often those most hidden during casual gaming interactions. Less technically, I mean that it’s pretty easy to be really serious when you’re playing eurogames, and sometimes it’s fun to let loose and have a fun game of accusations and betrayals. I’ve found that new game players are often intimidated by The Resistance at first, as the rules aren’t explicitly printed anywhere (unlike a board game or card game that gives each player a cheat sheet) and it’s hard to bluff effectively when you don’t know what you’re supposed to be doing. Even so, this is a great way to introduce new friends, especially outgoing ones, to a game that doesn’t require the typical problem-solving skills that more complicated games call for, meaning new players can often perform very well, even if they’re not experienced in traditional games. It’s also a team game, which means there’s a shared sense of satisfaction when the Resistance succeeds… or is crushed mercilessly by the Spies. The board for a 5-player game. A 40% spy-to-agent ratio doesn't bode well for the good guys. To help new game players pick the game up quickly and easily, I’ve developed a little game called “suspending disbelief.” You may recognize this term from any Michael Bay movie ever (I disbelieve that I paid $12 to see Transformers 2), but I apply it a little differently. It’s common for a person - even a talented, rational, adult – to respond to an unfamiliar social situation, like learning a new game with new people, by immediately reverting to negative self-talk. I’ve taken to specifically asking players to suspend their disbelief in themselves for the duration of the first game of The Resistance, in order to allow them room to discover their own talent in game play. I’ve had a great deal of success with this approach! As mentioned above, The Resistance comes with enough roles and reject/fail tokens for 10 players, enough guns (denoting those players sent on missions) and success/fail cards for 5 players – the maximum on a single mission – and playing board, each of which denotes the requirements for a game of a specific number of players (5-10). Also included are the tokens used to track progress towards victory for each team, and a bonus set of expansion cards for adding some additional elements to the game. 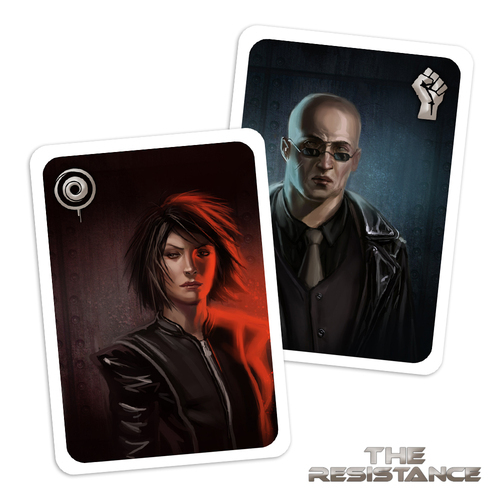 For the price, The Resistance provides fair value in terms of components and cards. I’ve played the game at J Gilligan’s (our home for Nerd Night) plenty of times and had no issues with wear and tear, and the cards are of quality stock. This isn’t a game I expect to have to replace any time soon. Some games take a simple mechanic and boil it down to its core, and let you play freely with that mechanic for as long as you like. The Resistance provides this experience for hidden roles, and I love that I can play a game in 20 minutes as a member of the Resistance, lead my team to victory, then become a Spy the next game and stab them all in the back. It’s the perfect mix of light game play and heavy interpersonal bluffing… with a short enough play time that nobody’s feelings are hurt for too long. The expansion cards that come with the game also add a nice bit of variance, as they provide actions that players can take to muck the game up (if they’re Spies) or gain information about other players, without revealing anyone’s identity outright. The deck of action cards is a nice addition that feels like a natural progression into more exciting play without changing the feeling of the base game, and I’d recommend that any group try it after a few warm-up games with the basic rules. There’s something special about playing these types of games with your friends,specially in your close group of game buddies, as they bring you together and teach you about each other in ways you don’t get from other games. I recommend The Resistance to any regular group of 6 or more players, particularly if you’re looking for something “different” to liven up those moments between longer, larger games. It’s also a great game to break out at a party when everybody’s tired of Cards Against Humanity and wants to do something a little more interactive… like crush the hopes and dreams of the human race!